Land Morphology moved to a new office space a little over a year ago. One of the best features of the storefront space adjacent to Seattle’s soon-to-be-demolished viaduct is the garden. We’ve had fun developing it and watching it evolve over the past year. Like all gardens, there are challenges to overcome and particular requirements to meet. In our urban space we have a large itinerant population with occasional nocturnal activities; and that’s just the rabbit. The rabbit is an unexpected visitor, considering our space is surrounded by buildings and concrete. Fortunately the rabbit prefers the northern planting bed and leaves the southern garden to the neighborhood dogs. Our garden beds are a testing ground for us to experiment with plants before we recommend them to clients: on one side are our more formal perennials and some smaller shrubs, as well as existing katsura (Cercidiphyllum japonicum) trees, while on the other side we’re developing a looser, meadow-y garden.The glue that ties these two beds together is the proliferation of bulbs. As gardeners are wont to do, our first fall/winter in our new home occasioned the planting of over 1,000 spring and fall blooming bulbs. All 1,000 of these bulbs were put into an area slightly larger than a city-sized front garden and still didn’t entirely fill up the space. Our early flowering season began with an explosion of beautiful crocus (C. vernus ‘Jeanne D’Arc) and muscari (M. armeniacum ‘Saffier’). Last year the show continued with two lovely Northwest natives Camassia leichtlinii ‘Alba’ and Brodiaea ‘Ruby’ (syn. Triteleia) but petered out into the summer. To remedy this we’ve added perennials like Geranium ‘Blue Sunrise’ and Lavandula x intermedia ‘Alba’, as well as two standard knockout roses to act as living sculpture. Daffodils brighten up our garden in the shadow of the viaduct. We’ve taken over the beds on the opposite side of our path to give us a part shade/shade place to plant. We’ve added in Astilbe ‘Visions in Red’ and many types of groundcovers including Ajuga reptans ‘Black Scallop’ (underperforming) and Erodium x ‘Album’ (good performer). We’ve had to use smaller statured shrubs to limit potential hiding places and have had good luck with Sarcococca humilis var. humilis and discovered that rabbits enjoy Styrax japonica ‘Fragrant Fountain’ and Hebe pinguifolia ‘Sutherlandii’. In true Daphne form one of ours has found its niche, while the other three have sulked their way into the compost bin. We are currently waiting for all our tulips (in Land Morphology orange!) to push their heads further out of the ground. And, because you can never have too many bulbs, this past fall found us out planting another 2,600 to ensure there was plenty of color for our neighbors to enjoy. 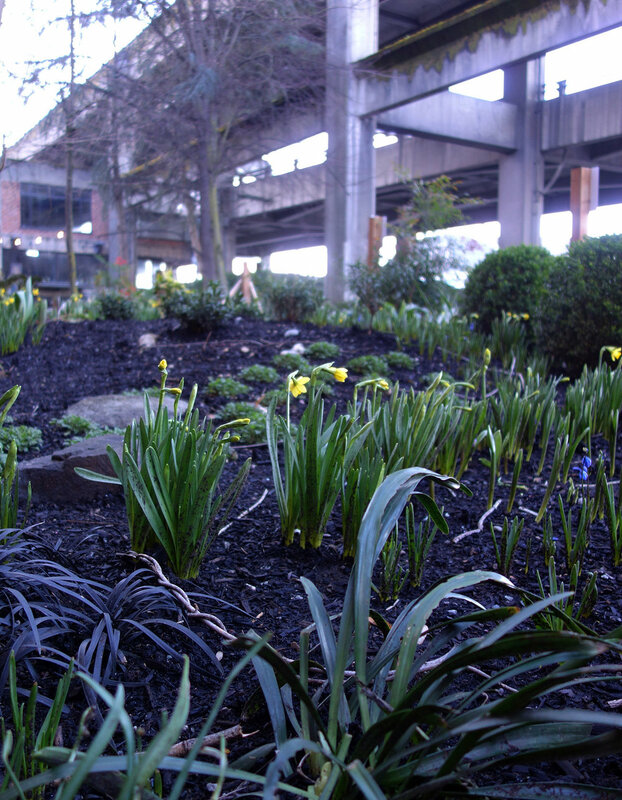 and should the sun ever shine in Seattle again, it will reflect off the 250 daffodils (Narcissus ‘Tete a Tete’ and ‘Thalia’) we’ve planted in rivers of sunny color through our shady beds. If you’re driving on the viaduct going south take a peek over the side and check us out!